Rooms at the Swan and Dolphin are spacious, modern and wonderfully Disney! As well as the blissful beds, with fluffy pillows, crisp sheets and a super-soft comforter, the rooms also offer custom designed soft furnishings and designer wallpaper. Rooms are fitted with a bureau-desk, a flat-screen TV, mini-bar (or personal pantry service), internet access, safe, make-up mirror and daily newspaper. 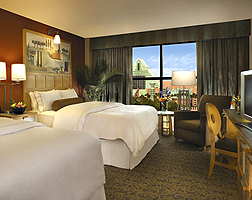 All rooms have spectacular views across the hotel complex and lake, with some even facing the sights of Epcot! Rooms range from the standard guest room, which can include one king-sized bed or two double beds to suites which come with extra room to work or play. Presidential Suites are the largest, these include a separate parlour, guest room, grand piano, kitchen, wet bar and even a feature balcony.